Data entry fields for pupil sizes where not visible when SMILE or PRK was selected as surgery type. This has been fixed with 5.60a. Hyperopia Nomograms now in Plus-Cylider display. New file format for IOL data export to IOLcon.org. New! Export of Excel Nomogram look-up tables for myopic, hyperopic and mixed astigmatism treatmetns. Details improvement and bug fixes. Filter settings remain unchanged until restart. Improved Nomogram functionality inclding mixed astigmatism nomograms. IOL data export interface for constants optimisation on the IOLcon.org website. Support of high resolution wide screen Monitors. Numerous bug fixes and detail improvements. Fields for implanted IOL data (SEQ, Sph, Cyl, Axis) where not updated during data entry. This is fixed now. Biometry data (ACD, LT, AL) can be deleted again in case of wrong data entry. Additional corrections and format changes in the data entry form. Near Add and other field contents have been added as option in table view. A bug which made it impossible to import Schwind Amaris data was fixed. Updated near vision graphs after data entry. The data entry form has been changed for toric IOL. Now SEQ + CYL or SPH + CYL can be entered. The data entry form has been optimized for 125% font size on high resolution monitors. Faster page changes when scrolling through patients. Two new graphs about ACD and Axial length distribution have been added under 'cataract outcomes'. Several minor bug fixes and label changes. Support of hebrew MS Office versions. A bug which prevented users from entering or displaying the power of an implanted IOL on the IOL data tab was fixed. During conversion of older data files eyes filed as IOL-Cataract patients lost thereir surgery type describtion and got labelled all as 'IOL-Cataract'. This bug was fixed and the old surgery type classification is maintained. Some minor changes on the IOL tab of the data entry form. Completely renewed version with many detail improvements, new tools for refractive and keratometric vector calculation and new graphs. More fields for cataract surgery outcomes and support for large screen resolutions (zooming function). Better implementation of trendlines and +-1 D limits in all scatter plots. BDTA data import does not overwrite changed month columns during re-import. Data Import: smaller changes in the BDTA import interface. Graphs: A bug which caused empty graphs in datasets, which contain only hyperopic eyes, was fixed. Graphs and Filters: new Graph for astigmatism outcomes: 'Angle of Error', showing the vectorial axis change between preOP and follow up. 2nd new Graph: pachymetry over time. A new filter option shows only eyes which completed all selected follow up visits on over time graphs. Fields and Forms: a new qustionaire field has been added. Minor changes in data entry form. 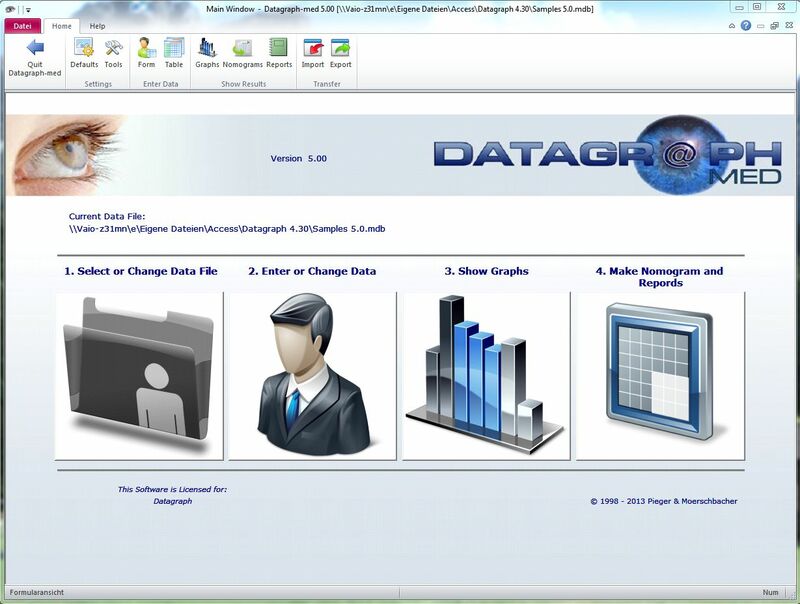 Data Import and conversion: IOL lens data is transferred again from former Datagraph-med version 5.1 or before files. Import: Keratron Scout import of K-values does not overwrite existing data. BDTA import: now independent of regional settings (accepts . and , as decimal delimiter depending on country settings) Bug fixed when importing deciam VA data. Extendet import format including Decimal and Logmar VA and surgery type. Amaris Import: bug fixed which prevented importing data. Graphs: average/min/max values on scatter plots changed sign. Bug fixed on empty graph titles. Import: recalculation of all attempted correction values after excel import based on preOP and target refraction. Amaris import bug fixed. Keratron Scout import now including K-Values. User Interface: IOL power entered as SEQ and optional cylinder power in toric IOL. Immediate update of refraction type and attemped refraction when preOP values have been changed. General Improvements: New fields and forms for Carl Zeiss Meditec VISULAS Flex and Smile procedures. Additional fields for IOL calculation parameters. Import: Sirius data import extended. Import of ULIB IOL constants. General Improvements: Better Office 2010 compatibility. Faster Performance of scatter plots and table. Axial lenght data impored correctly from previous versions. Graphs: new graph Attemped vs. Achieved over Axial lenght which plots the deviation from target in cataract outcomes. Import: Schwind Sirius import now writes SimK values into Keratometry fields when importing Corneal WF data. new version with many detail changes, new features and extende file format. Graphs: more graphs with changeable scales; new vector change double angle polt for refractive and keratometric cylinder. User Interface: Additional fields for Cataract/IOL data. IOL constants can be entered manually or copied from ULIB Database. Import/Export: BDTA data import empty target values fixed. Cyl and axis values imported correctly. new layout and compatibility with Windows 8 and Office 2013. Many internal changes and new graphs!